This is hands down one of the best dishes that I make. 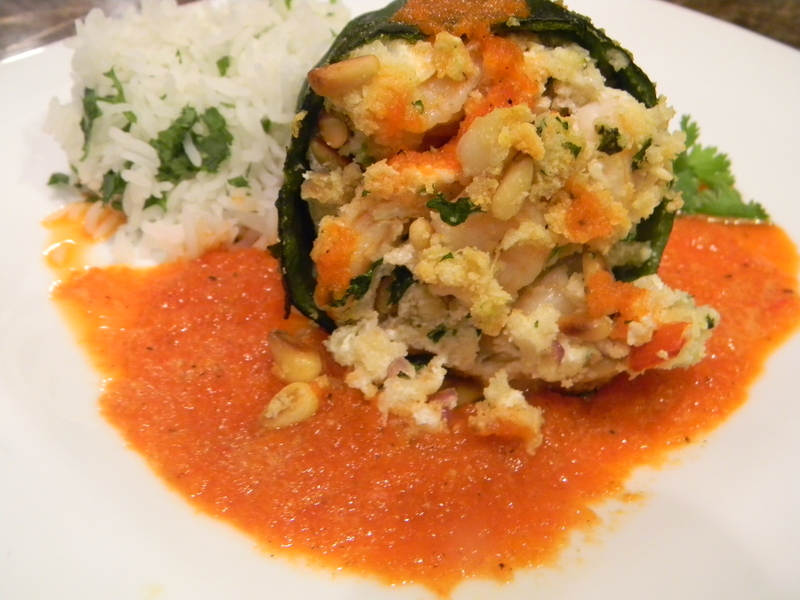 The pine nuts add a little crunchiness to the mellow goat cheese and shrimp flavors. The pepper roasting is probably the most time consuming aspect of this dish but after that is done it is quite simple to assemble. 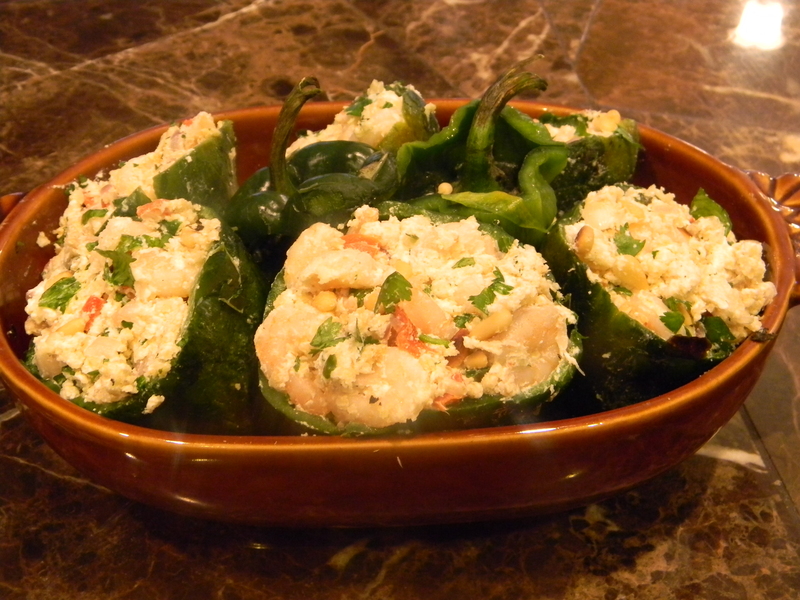 Don’t worry if your peppers tear up a bit while seeding them, the stuffing stays inside while baking. Also, instead of standing the peppers upright to cook, you can leave the tops on, slit them on the side to stuff and lay them down on a baking tray. 2.) 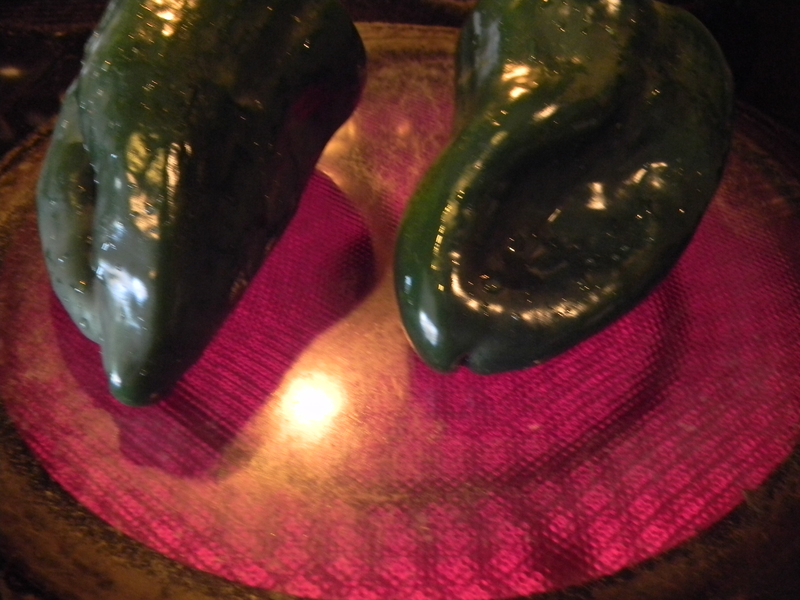 To roast your peppers, direct heat is best to char the skin. Turn your stove burner on medium-high heat and place 2 chiles at a time onto the burner (you can also do this on a grill or under the broiler). When one side turns black, turn the pepper with tongs onto another side. Don’t be afraid to burn them, you want the outside skin to be almost completely black. This process will take about 10 minutes total. Continue roasting the rest of the peppers. When all of the peppers are roasted, peel off all of the charred skin over the sink. 2.) When cool enough to handle, cut the tops off of all the green pasilla peppers OR cut a long slit into the side of each one. Remove the veins and seeds (this is where the spicy heat lies) carefully to not rip up the peppers. Set aside. 3.) In a large saute pan over medium heat, toast the panko crumbs for about 5 minutes. Stirring occasionally until golden brown and toasted. Place panko crumbs in large mixing bowl. Place the same pan back over the heat and toast the pine nuts until golden and fragrant, about 2 minutes. Place pine nuts in bowl with panko crumbs. Again using the same saute pan, heat 2 tablespoons olive oil over medium low and add the 2 minced garlic cloves and shallots. Saute until softened, about 3 minutes. Let cool slightly and add to panko bowl. 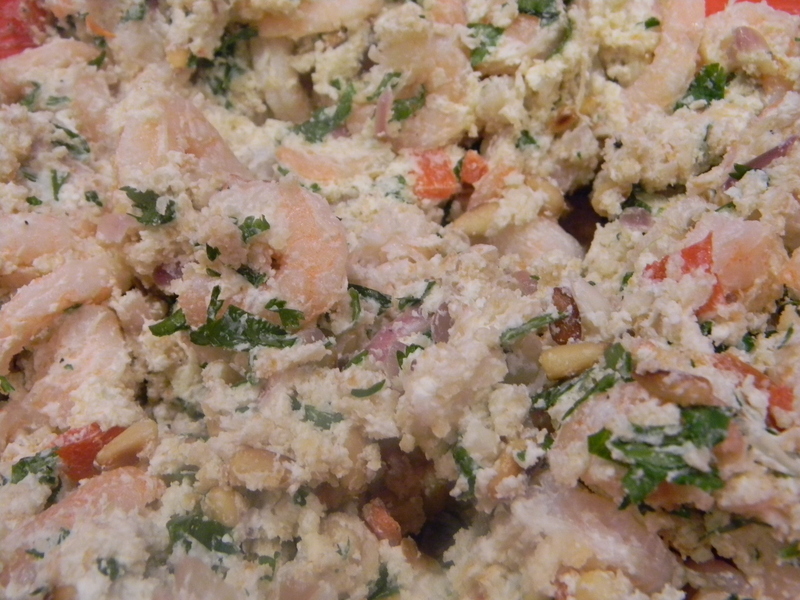 Add shrimp, goat cheese, cilantro, salt, and pepper to panko bowl and mix all ingredients well. 4.) Stuff the goat cheese shrimp mixture into each pepper. 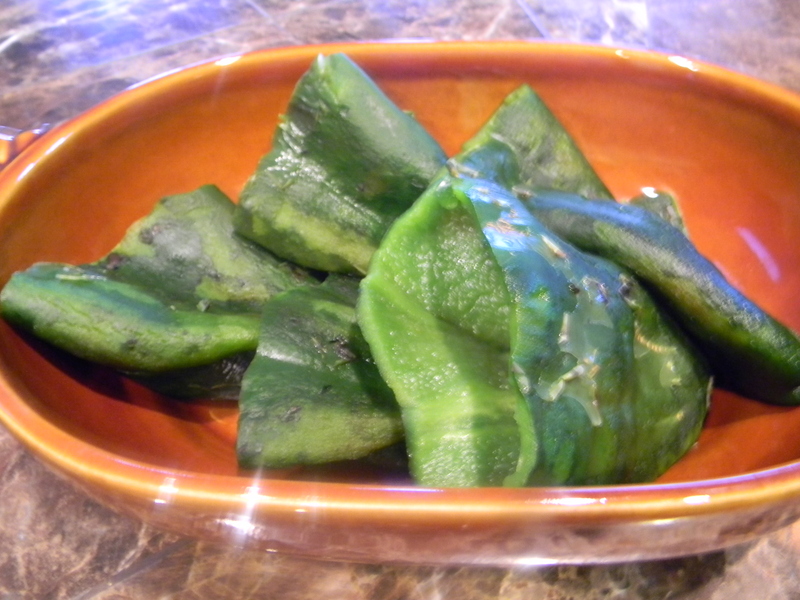 Stand peppers up or lie them down on a baking dish large enough to hold them and bake for 30 minutes. While the peppers are baking, make the roasted red pepper sauce. Remove the charred skin from the red peppers, cut the tops off, remove the seeds and place in a blender or food processor. Add salt, pepper, pinch of oregano, chicken boullion powder, and remaining garlic clove. Puree until smooth. Pour hot water into food processor feed tube or in top of blender and continue blending for about 20 seconds. 5.) 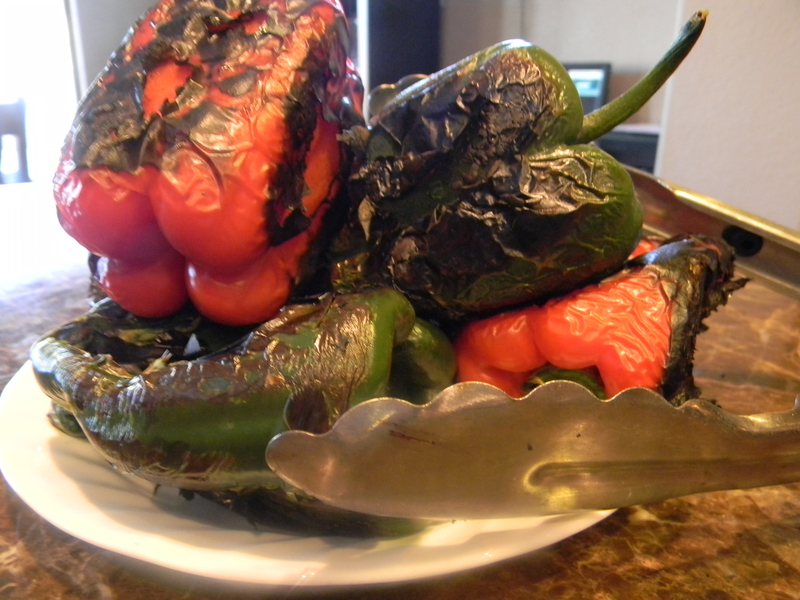 When the peppers are done, place one pepper on a serving plate and top with a bit of the red pepper sauce to serve. Garnish with fresh cilantro.